I’m starting off small; with Conditional Prompts. Just to clarify. A conditional prompt is a question that is placed in the query that allows you to fine tune the results that you return from your database. The problem is; sometimes you want to see “some” of the data, other times you want to see it all. This is fine if you are a report developer as you can edit the query to add or remove the prompt. If you are a report consumer then you are stuck with the query as it has been developed. 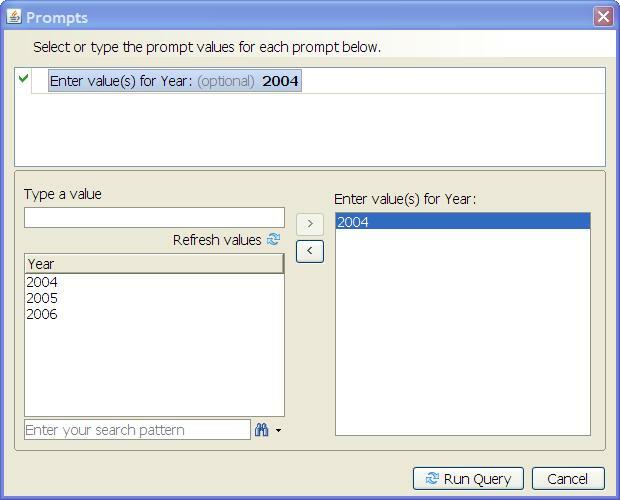 When you use a prompt object it will ask you “Enter value(s) for Year:” for example and then allow you to select one or more years. If you want to see all years, then you have to select every value from the list. This is fine for years as there are not so many of them. When you have “lots” of values this becomes a pain to select, you might miss one, your query becomes “ugly” as it has all of the selected values embedded within the SQL and some databases actually put a limit on the number of values that you can pass in this manner. This works because if the user types in ‘All’ then ‘All’ = ‘All’ would be true for every row, so you get all of your data. Again, this works but is more manual editing. This then has to be done on every object that you think that you will need this feature on. As of XI 3.0 there is a much more elegant (less labour intensive) way to do the same thing. 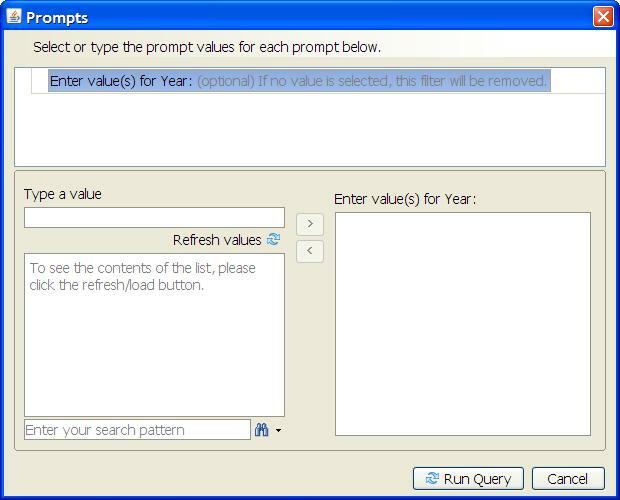 When you are building your query and you create a query filter you will see a new option denoted by the question mark icon to the right of the prompt text. 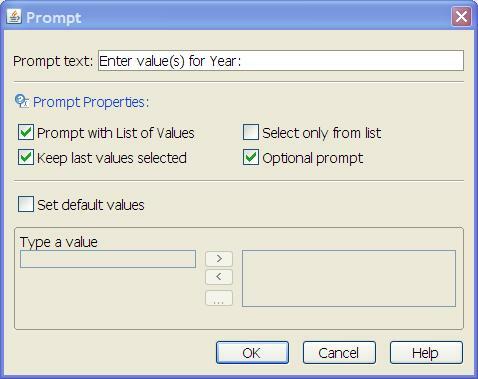 Clicking this icon opens the prompt properties dialog box. Here I have ticked the “Optional prompt” box to tell XI that I may not always want to supply values. For the moment I’m going to select a single year, 2004. When I run my report, you can see that only a single years data has been returned as requested. 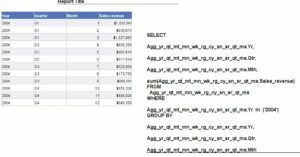 I have altered my report to also display the SQL used and notice how there is a “where” clause to restrict the year to a single value. However, notice that this time there is no where clause to restrict the data. Whilst this may not be the most earth shattering piece of new functionality, it is on that I think will speed up the report development process as it removes a lot of the simple but mundane tasks that a Designer had to do. It also results in much more efficient queries being sent to the database so the users should get their results just a little bit faster. I’m using Xi-3.0 WebI. I’m trying to set the propmt as optional but I can’t see the option to make it as optional (Prompt Properties dialog box with Optional button). I see the box without that optional check. Am I missing any settings? If you have a look at the screen shots in The “XI 3.0 Way”, the “?” icon should bring up the options dialog. The second screen shot shows the radio button for “optional prompt”. that’s exactly what we are looking for. However, your example was focused on WebI reports. Is the same feature working on DesktopIntelligence, too? I had a quick look and unfortunately I do not see this functionality in Desktop Intelligence. In 6.5 it works fine but in XI R3 DESKI it doesn’t. Any idea how to fix it? Sorry for not getting back to you sooner, it’s been a hectic week. Unfortunately and very unprofessionally I do not have my XIR3 virtual machine handy, I will have to build a new one from scratch before I can investigate this personally. Hopefully you will get a speedy turn around from the wider audience that that site gets. Apologies for not being much help this time. Need some info for one of the Project. 1. Can we access data from 2 different cubes on one Voyager workspace? For Ex: We can have a max of 4 components in a BO Voyager workspace. Out of which 2 are crosstabs. So, for one crosstab we are getting the data from one cube and for the other we are getting the data from another cube. Can we do this? 2. 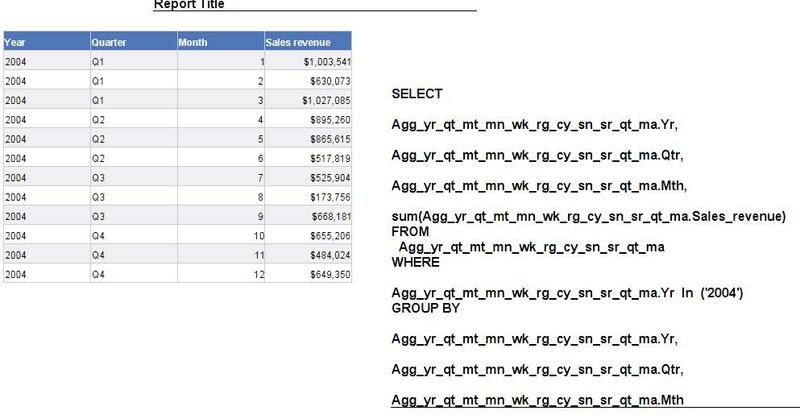 As we can access a Voyager workspace through Web I, Crystal reports and OLAP intelligence. but Can we access a Voyager workspace through Dashboard? 4. Can we create Prompts in voyager workspace? (My guess is NO we cant create prompts in BO voyager). If no then is there any alternative to that?? 5. What are the different kind of Analytics that we can add in a BO Voyager workspace? 6. As we know that Voyager was earlier OLAP intelligence the difference was OLAP intelligence use to sit on top of a Universe to fetch data from the cubes whereas Voyager directly accesses the data from the cube. Can we use voyager to access data through a universe?? 1. yes we can do that … create different connections for different cubes and then use one connection to access data in one crosstab only…. u cant use more than one cube in one cross tab. 3. yes very much but only from BO XI 3.1 version.. as this feature doesn’t exists in BO XI 3.0 or lower versions…. 4. I’m afraid my friend .. Voyager is not so friendly yet.. powerful but not so friendly…. u cant create the prompts. 6. yes very much… we can use universe to access the data using Voyager. need to create a connection in CMC for that.and need to configure it with that universe..
from where did you get these questions..
Dear, by any chance do i know you…..
Dear, By Any chance do i know you?? Previous Previous post: Made Me Smile !